Oskar Blues Brewery’s Gubna Imperial IPA opened without any sound from carbonation, but when poured into the glass it produced a nice head that held on for a long time. The lacing is very nice, too. The aroma is very rich in hops. There is a citrus aroma that rises up quickly to fill the air. The taste starts with a crisp bite from the hops. There is a rush of bitterness that just fills your mouth. The finish starts to present a little hint of the malt backbone of this beer. The 10% ABV is hidden in the cyclone of hops flavor. Overall, this is very enjoyable beer. The can makes is it easy to travel. The high ABV will or should slow you down some. 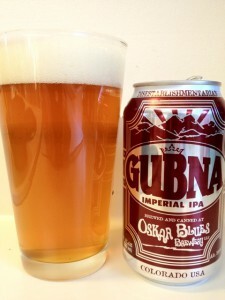 This entry was posted in Brews and tagged Oskar Blues Brewery by Brian Allen. Bookmark the permalink.